For me, cooking is an expression of love. I love to cook and I cook for the ones I love. Great food is nourishment for the body and soul. Whether it's a savory entrée, a refreshing drink or a decadent dessert, we all have those favorite dishes that take us back in time. I was born in the City of Light, Paris, France. My parents emigrated from Saigon, Vietnam in the mid 70s. From early on I was exposed to both cultures and cuisines. I love delicate French pastries and crave all the traditional Asian seafood dishes. In my mid-twenties, I moved to the sunny San Francisco Bay Area to be with my husband. Like me, he is the child of immigrants, though his parents are from India and he was born in the US. We have a big family here, so there are always plenty of mouths to feed. We have a 14-month-old daughter. My husband has four little sisters, ranging in age from 9 to 17. My husband and 3 of his sisters are vegetarians. My father-in-law is a vegetarian but he only likes spicy Indian food and is allergic to mushrooms. My husband's 12-year-old sister is deathly allergic to eggs and all nuts (except peanuts, go figure!). And the rest of us are meat lovers. Dinner is always a production at home because of everyone's dietary restrictions. I've learned lots of tricks and techniques to create easy, flavorful veggie and meat dishes, as well as desserts to satisfy my hubby's sweet tooth. Phamfatale.com is my way of sharing my passion with all the other foodies and femmes fatales out there who want to put great, memorable meals on the table for their loved ones. I know a lot of people guard their cooking secrets like they are a matter of national security, but I'm a believer that knowledge is meant to be shared. So I'll be sharing all my secrets, and those of the best cooks I know. I hope you join me on this new adventure and share your tips and secrets with me. All the photographs are taken by me. I took a photography class last Fall. Thanks, Kate for all your help. UPDATE: A huge thank you to Carole Florian. Carole's been editing all the recent posts on PhamFatale.com. I make a lot of spelling and grammatical errors and because English is not my mother tongue, my idioms are sometimes idiotic. Carole, thank you so much for making me sound good! I love your recipes, the fusion with Asian, French and whatever is great. I do not have recipe for you, but I use tarragon with grated ginger over fruit. I am serving your citrus chicken tomorrow night at a dinner party and will have a large tropical fruit salad dressed with tarragon and ginger for dessert. I will serve ginger ice cream and sorbet with the fruit. I too believe in sharing cooking tips. That helps everyone keep a fresh new side to the dishes they serve. It was really nice to meet all of you on Sunday evening. I am glad you liked my cooking. Please send me your email address. Hi Jackie!! Thanks for stopping by my blog. I am really enjoying all your recipes and photos (so beautiful!). I love French food so I will definitely be checking back for some recipes to try. Thank you so much for your comment on my blog. I have been to your blog several months ago and remembered it when I saw your name. I'm honored that you 'visited' my site, as I think yours is just BEAUTIFUL!! Lots of eye candy here for sure! Great work. You are an amazing woman and roll model to all women. Your website is wonderful and I am sure you will inspire a lot of people. Thanks for posting all the yummy food. The name Pham Fatale is truly inspired! Making the experience even more unique is the way you've made use of the French, Vietnamese, and Indian elements of your own background in organizing the site the way you have. The Indian dishes are especially appealing. I am new to your site. My brother forward me your site as I was in search for a recipe for banh cam. Will continue to surf your site for future ideas to cook. Thanks. oh and a great site you have going. Neu duoc, chi email lai cho em nhe. Cam on chi nhieu a. Email cua em la vulanchi2004@yahoo.com. o phan comment em khong noi duoc nhieu, nen chi em minh neu duoc se trao doi them qua email cua em nhe. Jacqueline- your bio is very interesting and aspiring. Me and my husband are based in KS and are of Indian origin. We both are vegetarian but our 3 kids are "carnivores" :).. Looking forward to trying all the interesting recipes you have here. Your website is soooo fabulous! Well done, Jackie! I can't wait to try some your recipes. They all sound so delicious, the only problem I will have is deciding which one to make first. Btw, on oneof your recipes that uses ginger, you instruct to peel it with a knife. I've found the easiest way to peel ginger is with a spoon. The peel comes right off and there is less waste. for you site. you've brought me to the foodie side AND i love it! We met once at your father-in-law's place and I saw this website on talat's facebook. I have been surfing through it for the past two hours. I think I fell in love with it. I really enjoy the personal comments that you add to each recipe. I am inspired to cook more now...it reminds me of my younger days. Thanks so much! JACQUELINE - We have a pizza and beer place in Arvada, Colorado, that serves an Indian style pizza called Taj Mahal. I did some searching and found your website, with a similar recipe, but with lots of tips and small secrets for making it taste better. I need to check your website to see what other recipes you have. You are a great cook. I have been making hummus with black sesame seed tahini, making the hummus look like "asphalt," according to a friend. Since I have a large batch in the fridge, I need to make an asphalt hummus pizza soon. Unlike you I am not a natural cook, and next week have 20 ladies coming for breakfast for my 40th birthday! I am wantng to do a nice stack type savoury dish. Was thinking perhaps a crumpet (or something similar - all suggestions v welcome!!) as a base and then layered scrambled egg, grilled bacon, mushroom, etc. (All suggestions v appreciated!) - perhaps topped off with cooked tomoto, fresh basil and a nice sauce drizzled over. Have you ever made anything like that? Would really appreciate all suggestions! I'm like you, in a way that I relate food to love..Just happen to browse through your recipes and photos.- I'm not a cook nor a chef by profession but I think I can hold my own. - I truly enjoy your expressions and presentations on your web. - It's almost like I was entranced by what I was browsing through. - I just can't take my eyes off until I finished all the pages! - One of these days, I will try some and maybe all of your recipes. - I wish I could print all of them but I noticed a copyright sign. - Can you just put them in a binder and start selling them? - Thanks for an enjoyable entertainment!! - By the way,..this is my first time ever to put a comment on any recipe. - you deserve the praise!! thanks for the lovely site! its a pleasure to read and also a great source. i love your vichy carrots - though i omit the molasses. and sometimes add a tiny bit of lemon juice. great either way. Congratulations! Your site is great. Just one thing that I think you would agree with me about the so-called "Chinese New Year" mix-up. Actually it should be named "Lunar New Year" as, you know, it is not exclusively for the Chinese people. Even Taiwanese people they still refer it as "Lunar New Year", not "Chinese New Year." Hi Jackie, thank you so much for sharing your recipes. So much information on Vietnamese vegetarian dishes, all of them look amazing. I definitely want to try to make them all. Love your site; I met some lovely Vietnamese while I lived in France. Love your style of cooking, to me it is inspired and authentic. Great website, great recipes. All of your recipes are so fancy. I can't believe you make these amazing dishes everyday. Seems like we have a few things in common: I'm Vietnamese, my husband is Indian & we live in the Bay Area. I was wondering if you have any everyday basic recipes like dahl, idly/sambar, pav bhaji, etc...that's vegetarian. I'm learning how to cook Indian food and can't seem to find any recipes that my husband likes. Thanks. I just wanted to drop you a note to say "Hi!" I've been reading and stealing your recipes. Awesome photography! Your background is fascinating! I had a baccalauréat II since when? I will search your web for some french dishes (I love langoustine thermidor). Thanks for sharing your recipes. Was pleased to see a mobile site but it needs a search tool or an index to help navigation & quick finding of recipes. Hi Jackie, just found your blog. With your cultural background as well as your husband's, I'm sure the food at home are all fabulous! I love your blog. Shall return again. Cheers! Just wanted to drop a note to say that I love your website! Keep up the good work - I haven't tried any recipes yet, but I will definitely be trying some soon. I live in Milwaukee, WI now (born and raised in the Bay Area) and I've been craving some of those Viet dishes that you have on your site. Can't wait to make some at home. First-I adore your site. Like your husband, I'm an Indian vegetarian, and I think you're one helluva great cook ( and wife and mom! )to take the extra effort of making vegetarian versions for your family.A lot of which, I'll be trying soon. Since you use gluten for one recipe, do you ever make your own too? Cos, I came across afew recipes on the internet, and I'd be curious to know your take on the same. Hi, are you the same Jackie Pham who danced in the Stanford Viennese Ball in 2009 and 2010. If so, I think amongst all the female dancers, your dancing form and style really stood out as being the best. Your curtsy, left arm movements, jumping, head movements were all stylish and refined. If you're not that Jackie Pham, then sorry. 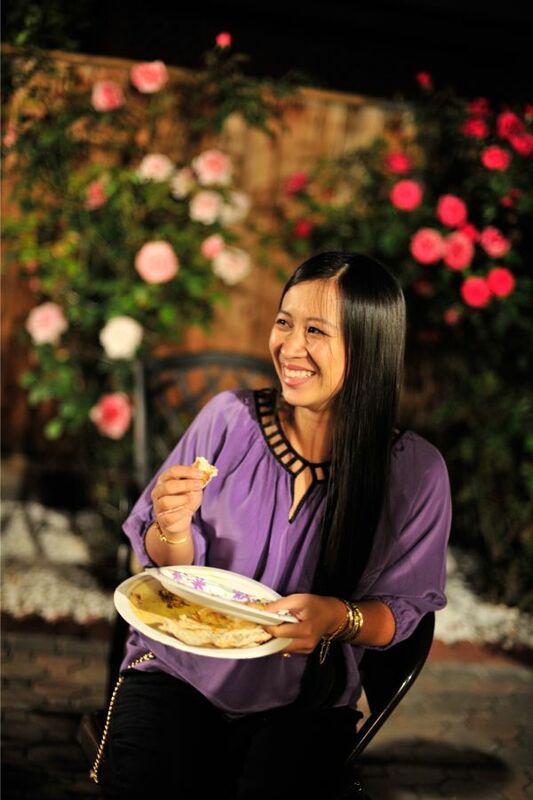 Thanks Jackie for sharing your enormous culinary talent for outstanding Vietnamese and Indian dishes. Your instructions are clear and shopping tips really help. Your dishes remind me of home and take me back to my roots. I have tried many of your dishes and my family and friends are always asking me for help in the kitchen LOL. Take care and may heaven always keep your website running smooth. If you ever publish a hard copy book let me know I want to buy it. excellent recipes beautiful photography - a class act. here is my very simple vegetarian couscous with paprika champignons recipe combining middle eastern/north african couscous with hungarian-style mushrooms. In a large deep frying pan, sautee the onions in oil over low heat minimum 10 minutes. Change to medium heat. Add bell pepper (capsicum), season with salt, pepper and plenty of paprika powder, sautee for a further 5 minutes. Add butter and mushrooms, sautee 5 more minutes, take off the heat and stir in 1 pottle of sour cream. Meanwhile, cook couscous in water having dissolved 1 vegetarian bouillon cube. Heap couscous on flat serving plate, top with mushroom sauce. Instead of the couscous you can make it with galuska. This is a very filling meal and can be accompanied with a dry white wine. I love your blog. I found it a few months ago looking for Indian recipes because I love to eat Indian food but wasn't sure how to cook them. Then I landed on your blog and you have so much diversity in your cuisines!! I, myself, am Asian (Hmong) and love to eat all types of cuisines. I have spread the love of blog to all my friends. Keep up the great work! I have assigment from my lecture to find fermented food from vietnam. I'm very confuse. can u help me?? You need to get out of town Jackie. I spent half of my morning drooling over your pictures & recipes. This is such a great web-site! I will definitely be giving these wonderful recipes a try. I love cooking too much. I saw your common attitude , I like it. Congrats Jackie, you go girl! I am so happy to have found your excellent blog. Not only have you an amazing range of recipes, but your food pictures are to die for! And your story slightly resembles mine, since I was born in Europe and married someone of Indian origin, and live in the US! Will come here often- thanks for the amazing site you have! Hi Jackie, I'm very happy to find your blog as we both share a love of cooking, cooking Asian + French-European food, and multi-cultural veg-omnivore families. I'm an American who lived almost ten years in East Asia, but I now live in Belgium with my francophone husband who trained as a chef but is too busy to cook(!) He has two older children who are Muslim/half Morrocan who visit frequently, while our baby daughter will start solid food this week (she's six months old today). Cooking is a challenge for our family of diverse tastes. Thanks for inspiring me! Love your multicultural background. Same here...parents from India, Japanese Brazilian wife, live in SF...and she LOVES Indian food...appreciate your recipes. I LOVE YOUR WEBSITE! i can just stay at home all day looking through the recipes. I'm going to start cooking school in September ill be sure to post tips but i doubt that i'll be able to post anything that you haven't already figured out. Thank you for your time to read this message and look forward to hearing from you soon. What an interesting and exciting background you have, Jackie! Your blog and photos are just fantastic. Look forward to learning some great recipes from you. We have the same family name.I am married to a vietnamese and we have two daughters,both in the U.S. taking up their Ph.Ds.The older one has graduated last year and now working at the Misissippi State University.We are residing in the Philippines.My husband Chay recently bought a lot of bitter melon and so I thought of looking up for a vietnamese recipe for the bitter melon that he always orders in the restaurant.I googled for one and I saw yours.I hope I'll have some success preparing this . I am Laura J. Pham. I've been looking for Indian recipes all over the net, and have not come across straight forward and delicious ones as yours! Your website is absolutely superb, many thanks. I I just found your blog, and I think you´re very creative and nice, very interesting recipes you have I love to cook too. Where can I find young Jack fruit in the Bay area? thanks for sharing, im a malysian chinese, love to cook and eat !! !my niece in australia married a veitman man, handsome..well brought up by parents who went there as ``boat people``in the 70.. I am so glad I found your blog! I was recently turned on to Indian food while visiting San Fran- we ate at New Dehli Rest and had wonderful meals there. I had a drink called Shah Jahini Madeera and I've tried to find a similar recipe- do you have any suggestions? I have a questiom on your creme brulee, which happen to be a favorite of mine, I am confused to what is the amount of chocolate is neededd; and what is lemon peel (chocolate). Thank you. Do you have a good, quick, delicious, rich and easy recipe for goan fish curry? I am in love with the goan fish curry at a local restaurant and want to make it at home. thanks so much. love your blog. I am very interested in your web-site which is fascinating. May i have your email address? I found your recipe searching for chai creme brulee - to serve with cinnamon and red wine curry beef short rib, spiced sweet potato soup, and a green salad! I browsed around your site and will definitely come back and try more of the recipes. I eat mostly vegetarian and am always excited to find tasty new veggie mains! I just found your blog and i love all recipes you posted on the site; especially indian cuisine. My husband is nepali and somehow nepali cuisine and indian cuisine are very much the same. I'm vietnamese and a meat eater for more than 25 years, now being a vegetarian for almost 3 years coz my husband is vegetarian. I'm sorry if the question is quite personal but still wondering your husband's side is indian so you still prepare beef? I JUST stumbled upon your recipe blog today. I was introduced to burfi or halwa this weekend, and of course decided I HAVE to make it! Thank you for posting the recipes. I cannot wait to try them out this weekend! HI -- just stumbled upon your blog...it is great. I am wondering if you could help me out with some menu ideas for a TET themed dinner party? I would like traditional vietnamese food to be served but seem to only find fusion menus...help! I our love your blog. I'm love French food because of my mom. I was looking for a good recipe of French macarons but I didn't see it in your blog. Anyway, I still love your blog. Great to meet you and your blog Jackie, I will definitely return for more helpings. It was nice to go through your web. Thank You for building a source of knowledge. Also, I personally ask you, if you need any assistance from INDIA, then without fail, ask me. I will do it for you. Also, Welcome to my country India, A home of Spices and Green Vegetables. I wish to keep in touch with you. Not sure how this works, but send me an email - address above - if you receive this. Found your website while looking for a recipe for Lyonaise Potatoes, and was blown away with your site. Your photos are so professional. I envy your talent for taking pictures of food. I too love cooking. I look forward to sharing recipes in the future. Thanks for sharing your love of cooking via your site. I am soooo happy that i found your blog. I love it!! All the recipes are so well put together and easy to understand. You even have picture of ingrediences that i am not sure of. Thank you!! I am also a foodie, currently enrolled in a 1 year culinary program at Kendall College in Chicago. I am amazed by your site, your recipes, pics, and detailed comments. I could learn more from your site than from any class I have taken so far! I am American, my husband is from Bangladesh with many friends from different parts of India and Pakistan. I have been learning different techniques of Indian cuisine and would love to expand my recipe base and your site is perfect for me. My oldest son has a peanut allergy and my middle child has an egg allergy. I think both he and I are gluten intolerant so I am trying really hard to keep him from eating wheat. Thank you for your site! This is my correct link, I typed the wrong Url the first time. My name is colette, I live in columbia, Md. My hobby is cooking, and once I have time (ususally on the weekend) I love to cook and try out new recipes, I fumble on your Phamfatale (femme fatale!) site and fall in love with it.. I stumbled upon you site while looking for some Vietnamese vegeterian recipes. I love the layout, photos, and your commentaries on your site. I can't wait to try your recipes - the food on your blog are totally my favorite things and appeal to my tastes. Thanks again for sharing part of your world and all your awesome work! Your family is one lucky bunch. I enjoy reading your cooking recipes. Keep it up. I found your website when I was looking for taro vietnamese dessert (with coconut milk). Your family background is very colorful, and it's great that the separate elements do work together. I, like you, enjoy cooking especially creative cooking. I enjoy entertaining and love French pastries as well. I live in SF, and hopefully we could meet up some day over a meal. Thanks for creating such a website. When I am a little more awake I'll send you a couple of the recipes I have made up and or adapted from other recipes. I was looking for some Asian desserts and came across your website. It is beautifully designed and the pictures are very eye catching as they are delicious! I came here looking for a cake that isn't too sweet and would be good for my two children's birthday. My big family is not too into very sweet dessert so I'm searching for a recipe that will satisfy everyone. Do you have a suggestion? Something spongy and not too sweet? Thanks and I will be back to get some ideas from you!! I am so impressed with your Blog here. I love to try new recipe's all the time and I cant wait t get my hands on some of these. I am looking for Traditional Chinese New Year recipe's-The main one I am looking for I do not know the name of, But it is like a Tamale here in Texas, but comes in the shape of a Diamond in the Chinese version and is supposed to be a staple food during the Chinese New Year festivities. Do you happen to know what these are called, and if you do, do you have a recipe for them? What a great website! So glad I found it, since I love to cook asian, vegetarian, and indian dishes, but have a hard time finding good recipes on the web. Thank you! I was searching for a vegetarian recipe of "Fish" sauce and landed on your site. I just wanted to congratulate you since it is very very well done and I liked your comments on your family being like a melting pot :) I sort of feel the same way too. C'est vraiment sympa de pouvoir trouver des recettes en plusieures langues. Il n'y a plus des frontieres pour les papilles! It is a pleasant surprise to see your recipe as I am a food lover, I do love eating Vietnamese food either veg or non-veg. Your recipe helps me a lot, since I left Vietnam many years ago and staying in Delhi. My Indian father and Vietnamese mother. It is nice to know that your husband also from India. All the best to you and your family. Stumbled across your food blog when I was searching for a dessert from my childhood in Malaysia - one that my mom used to make and I loved so...cassava cake. I haven't looked at all the dishes in this food blog but from what I have seen in the last 15 minutes , it is most interesting. And your fusion background is also equally interesting. Like you, I also live in the San Francisco Bay Area. Thank you for this wonderful food blog and sharing it with all of us. I hope to share some of my favorite Malaysian recipes with you so you may play with them in your deliciously fusion way. Captain Jackie, you are invited! --- Knapkins is launching July 2011. Based on your contribution to the foodie websphere, phamfatale.com has been selected as a featured food blog. We'd would love to showcase your favourite entries and photos on our site. We have already uploaded 14 of your blog photos with links back to drive more traffic to your website. The best part: IT IS FREE. To give us permission to publish these 14 photos, please click your special link. Looking for Vietnamese recipes I found your website. What a great recipes your present with beautiful pictures. I made a bookmark and will certainly check your site regularly. I really enjoyed reading about the main ingredient in all your recipes: love. Thank you sooo much for creating this wonderful blog full of delicious meals. Thank you for re-igniting my passion for cooking and making me re-learn how to cook vietnamese food. My recipe box is full of all cuisines and I appreciate the obvious love and care you place in each recipe. Love the photos as well because I eat with me eyes. I loved reading your story. My family has all sorts of food restrictions, too. My husband has ulcers and diverticulitis. One child is allergic to eggs. Everyone else has allergies. Your story has given me renewed energy to do my best for these loved ones. Thanks for all the wonderful recipes and beautiful photos! My first time here, haven't cooked anything fr yr recipe yet, but will do though ! impressive pix though, especially the vegan/vegetarian food. I like yr website a lot ! and Thank You ! Hi, I'm very glad to have recently discovered your blog. I'm Vietnamese, but born in the US and live in France. Your detailed recipes are much appreciated, especially the Vietnamese ones--to recreate childhood meals (from recipes written in English, I prefer!) and learn the English names of certain ingredients. Also, the vegetarian options to your recipes are extremely helpful. Cám on! I just discovered your website and love what I've read so far. Do you have a newsletter that you send out with recipes and tips? I will sign up immediately! Thanks and keep up the good work. Your blog is gorgeous, such amazing photos! I just traveling to Vietnam this past August (Saigon included), and I was blow away by the food. Asian cooking is the area I'm least comfortable with in the kitchen, so I look forward to learning from your recipes! Enjoying your website& all the great receipes you share~ THANKS!!!!! Ive just found your blog and I am OBSESSED. So many recipes to try! Ive just started my blog (which is more nutrition focussed) but I think some of your recipes might need to be my first port of call! Hi Jackie, you and your family have a very interesting background. Cooking time must be a juggling act to meet everyone's diet restriction. Kudos to you! As I read through your introduction page, I can't help but laugh! It sounded like my story!! Me too, married to an Indian guy! good to see your blog! and happily following! I can't believe I found you just by accident while browsing the web looking for VN recipes. My bf of 5 yrs is also American-Indian and I am full Vietnamese. So happy I found you! Thanks for sharing the recipes! Hi Jackie - just found your site and I'm excited beyond words. Like you I love to cook for friends and family. Thank goodness they share my passion for trying new cuisines. We are blessed to live in a very ethnically diverse community so I always have someone I can call for tips but having your tips so easily accessible is a treat in itself. Your photos are lovely btw. I like your cooking. You're my inspiration of cooking . Thank you for sharing with us. Good luck with the cook-book!! I googled "Carrots Vichy" which is a recipe my mother used to make and found your blog. Looks like you have a lot of great recipes here. Can you please send me your email id. I think the photography on your website is fantastic. Question: Would you have any interest in taking action shots of say 10 Restaurantware Products per month? I could make it a usually thing to send you a fresh stock of different products that you could use / not use however you wish. All that is required is that you snap some photos. Funny; I am following your blog now for years and now after living for three years in Bangkok, Thailand I moved two month ago to Saigon for the opening of the new MGM Grand & Casino in Ho Tram Beach early 2013! Love the city and its food and people, different to Bangkok for sure. Hello Mrs. PhamFatale - lovely blog. As you are concerned about your English, so am I with my French. I translate my blog into French and I am sure it is so idiotic, but it's my best attempt at learning French. So glad Google aimed me to your site. Vietnamese is fascinating, Asian & French. Have sent your link to many friends and I love it!! Signed up for your book & cannot wait. Thrilled to have found you!!! I am delighted with your Blog and will certainly will use many of your recipes. The first will try will be for Thanksgiving. I am also a mix of race, born in Brazil from Spanish, French, Italian and Germans, now I live in the Keys with my second American husband, I was a widow. Pham is a very common Vietnamese last name! LANGUAGE English is not my native language, but in the kitchen language is UNIVERSAL. Just wanted to say thank you for your website and all your fabulous recipe ideas!! Chuc Mung Nam Moi Jackie! I just wanted to wish you a happy new year and say hi! You are a woman after my owm heart... Even though we haven't even met... Would it be too foward of me to say that, I Love You...and your recipes???... I think You had me at French Pastries and Vietnamese food... I am looking forward to trying out many of your recipes. Now that I've professed my love, you probably want to know a little bit about me. Like you, I am also of Vietnamese decent and have a love of all things found in a French Patisserie. I make a Bahn Seo, (Savory Vietnamese Crepe), worthy of a last meal, (or at least that's what my husband tells me). Also, I make a super easy ginger chicken that is my go to one pot wonder for busy week nights. I look forward to learning from you and hopefully i'll even be able to share some of my recipes and secrets with you. I juste wanted to thank you for all those great receipes, you really inspire me! I am myself from vietnamese and chinese origins and born in France, currently studying as an exchange student in NYC, so your website is really helpful when I need to think of a receipe to cook for my friends! Thank you and good continuation to you! Just found your website by accident and love it! Then it finally click that I had came across your Bahn mi book on Amazon and thought possibly my friend would love it and before I knew about your site! I guess it was meant to be. What a delightful, humble and "pretty" lady. I wish you further success! Thank your parents for emigrating to Paris. I assume they were escaping getting slaughtered like millions of others of Vietnamese. Be proud of yourself, parents and cultures. I love cooking but I cannot cook. You know how some people are color blind, I am "flavor" blind. I can't tell what is missing in a dish that makes it super delicious. Anyways, I still love to cook and love to try all different kinds of cuisines. I've been trying to find something that sounded like "crème aunglay" I don't even know how to spell it correctly. Can you give me an idea of what it is? Thanks. Love your site and your story. Great Website, I appreciate you're doing this. Great resource, I can't wait to try the ingredients I find on here. Hello Jacqueline. I am a chef in Washington State and have recently started following your website. In short, you are brilliant. I am a single father of two and both of my children love your culinary creations. Keep up the amazing work.